A big thank you to all you hard working farmers out there providing nourishment for all of us. I have an aunt & uncle who are farmers so I know how hard you all work and appreciate ya'll. I designed this beautiful garter for a farmer bride and groom. It is hand made with love and care from yellow satin and emerald green organza. 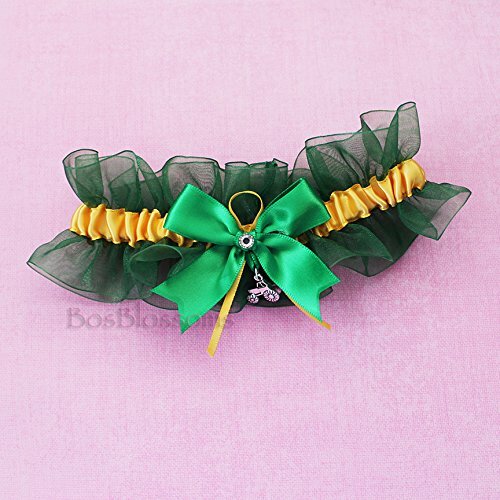 It features a big lush green bow with a yellow bow accent, sparkly rhinestone, and 3D tractor charm. It's carefully finished in a French seam so there are no raw edges and the ribbons are sealed to prevent fraying. As a finishing touch, I've added my "Something Blue" bow to the inside of this keepsake garter for extra good luck on your wedding day. You will need to measure your thigh where you'd like to wear your garter, and select the appropriate size. I will do my best to make sure your garter fits you comfortably. If this is a gift and you're unsure, message me and I can help give you a better idea what might be the best fit. I have dozens of colors available for this style along with many other charms. Feel free to contact me any time for other color combos, themes, or teams (NFL football, NCAA collegiate, NHL hockey, NBA basketball, MLB baseball, MLS soccer), or with any questions. Don't forget to check me out on Pinterest & Facebook and give me a "Like"!